When I discovered my gluten intolerance five years ago, baking was a big, foreign challenge. All the new to me flours, getting things to rise, not crumble into pieces or be dense and gummy, and most importantly – to taste identical to their glutenful partners. But whoa. 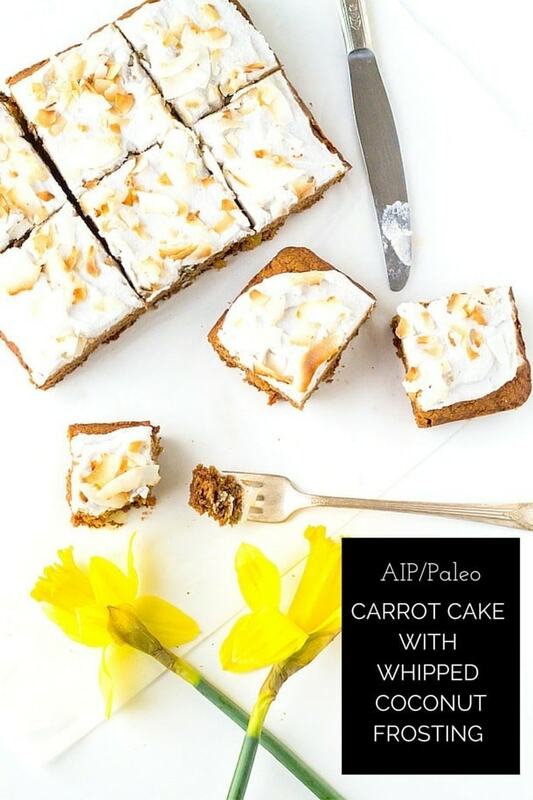 Nothing could prepare me for what I was going to experience while trying to make an AIP carrot cake, not even my dabbles in paleo baking because that relies heavily on eggs. No flours from grains/seeds/nuts, dairy, eggs (which also means flax or chia eggs were out), gums for binding or refined sugar. Although I don’t find myself craving sweets, I have missed the pleasure of a special treat. I wanted to change that, for myself and you, especially with Easter coming up. So six fails and a few choice words later, the Carrot Cake that I had envisioned finally came out of the oven. I hate the word moist, but truly it is. And just sweet enough from maple syrup, spring carrots and plump golden raisins. The smell of cinnamon, ginger and cloves float through the air while it bakes, and bring classic flavors to each forkful. 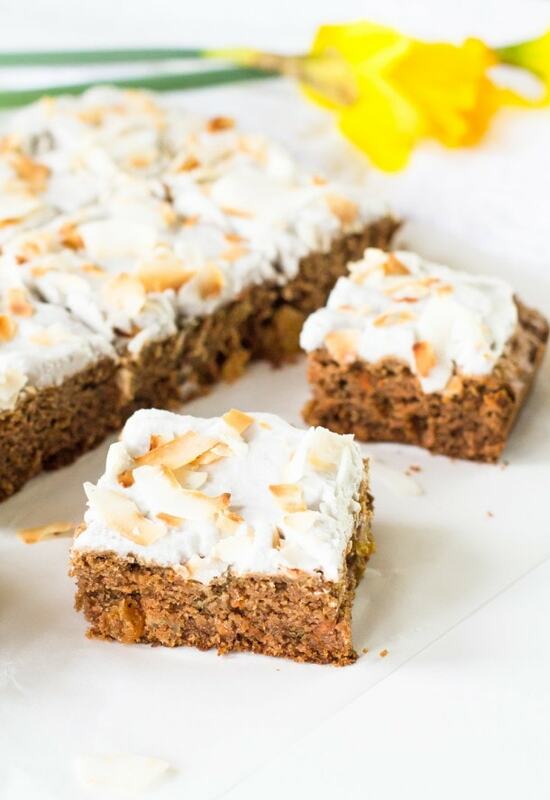 Topped with airy Whipped Coconut Milk Frosting and toasted coconut flakes, it was the best bite I’ve taken in a long time. For a combination of reasons, as healing through the autoimmune protocol is more emotional than I expected, and because I haven’t had anything dessert-like other than these little coconut gems in a month. 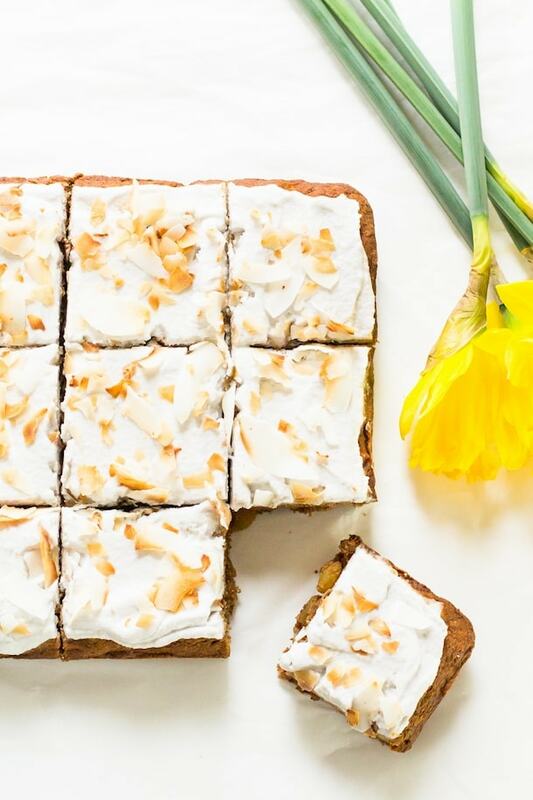 Without the chemistry of regular baking ingredients, there were a lot of components that were going to have to work just right to get this AIP/Paleo cake to work and be utterly delicious. My flour arsenal was arrowroot starch (or tapioca starch), coconut flour and tigernut flour. Tigernuts are actually a root vegetable, not a nut even though they kind of act and look like them. I’ve been enjoying them raw as a snack, mostly savory but kind of sweet like the profile of cashews. It looked pretty and tasted really good, but I couldn’t get it to bake through. Too much liquid compared to flour, and it didn’t rise much. It kind of held together, but it was dense, not fluffy like a cake should be. I started with a large amount of tigernut flour to little arrowroot & coconut, but found that less tigernut flour made for the best balance. The skin on a tigernut is quite tough, similar to the other outer bran of brown rice so it’s best for it to blend into the softer flours instead of dominate. I took out the dates, which made it too sweet, and from there I worked on the egg replacement. I really struggled with that piece, but making “eggs” from grassfed gelatin was the winning answer. They have mighty binding power, but do not result in rise. That becomes the job of baking soda in this recipe. And figuring that out ended up in another fail – too much of it with no acid to counteract meant a beautiful cake, but a terrible metallic taste. And then I finally hit the jackpot on this luscious Carrot Cake that looked good, tasted good, and felt so good to eat. I’ve been excited to share this recipe with you because I want all of us experiencing autoimmune conditions or food sensitivities to feel normal, especially on holidays when food is at the center of family and friends. I’d have to say that beyond the flares I’m experiencing about once a week, social settings have been difficult. 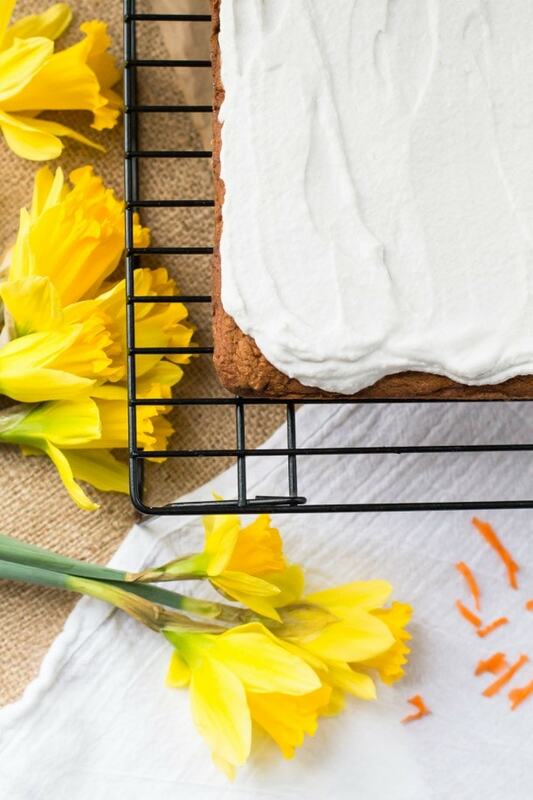 But for now let’s all make carrot cake, and embrace the sunshine of spring. It’s the arrival of a new season, new again fruits and vegetables, and opportunities to embrace the beautiful life around us. I highly, highly recommend using a scale and measuring for weight for any type of AIP/paleo/gluten-free baking because the weight of the flour is adjusted just perfectly for the amount of liquid. If you decide to use a measuring cup, don't pack the flour in. Take a spoon and add the flour to the cup, then level off. 2 gelatin eggs made by using these simple instructions - Make sure you use this make sure it is this red can of Great Lakes, not the green & wait until the below directions tell you to make them. If you wish to make these recipe vegan, you can use 2 vegan eggs using flax or chia seeds, but then this recipe will not be AIP compliant. Preheat oven to 350 degrees. Grease a 8x8 inch baking pan with a thin layer of coconut oil on the bottom and up the sides, in the corners. In a medium bowl whisk together the tigernut flour, arrowroot/tapioca starch, coconut flour, baking soda, cinnamon, ginger, cloves and salt. Set aside. In another bowl, whisk together the lemon juice, coconut milk, applesauce, maple syrup and cooled coconut oil. Add ½ of the wet ingredients to the dry, stir until combined. Then add the remaining half of wet ingredients and stir until no streaks remain. Fold in the carrots and raisins. At this time make your gelatin eggs, and stir them fully into the mixture. From here you will need to work quickly because the mixture gets very sticky. Spread into the pan, pressing down with a piece of wax paper to make smooth as needed. Bake for 18 minutes then set a piece of aluminum foil on top (not securing it, just covering it) and bake for another 15 minutes. Remove and test with a toothpick. When it comes out clean and not gooey, the cake is done. If not done, continue baking in 2 minute increments until it is. Let cool completely. 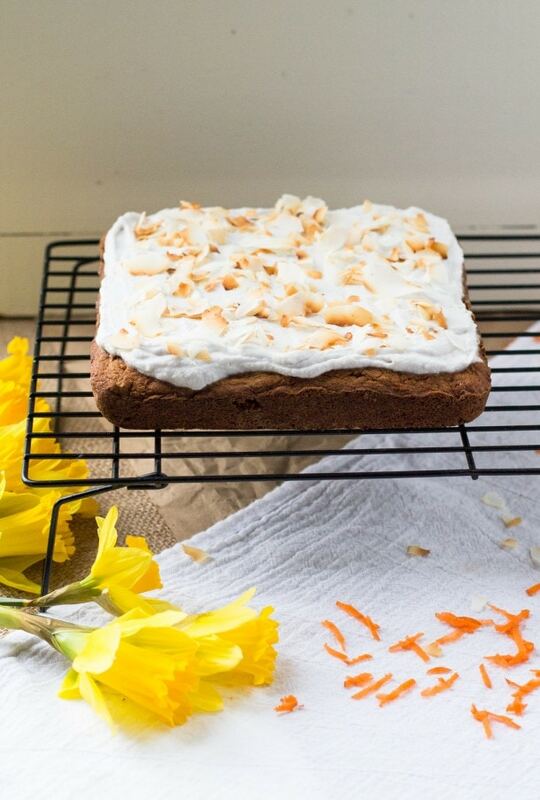 Carrot cake just can’t be beat, right?! Beautiful! What a perfect addition to the Easter table. Thank you for your persistence, I’m looking very forward to making this. You’re a wizard, Harry. (I hope you read Harry Potter.) The crumb on that cake looks perfect. Thank you so much for all of your hard work on this recipe! It looks and sounds amazing and I can’t wait to try it. I still am struggling with gut issues. Thank you for what you do for all of us! I’ve been waiting to see the results of your baking experiments! This sounds perfect… and to echo Melissa, yep, you’re a wizard. Love. Wowowoow! My goodness, this was made for me in every way! What a baking challenge! Good for you for sticking with it, despite all the frustrations. I’m so excited to try this cake because I know it was an especially laborious labor of love. I hope the new protocol works well for you, I’ll be following our journey and wish you all the best. XOX. Thanks for stopping by Steph! It’s kind of fun to have a challenge, and the end result paid off. I am feeling pretty good lately, so that helps my daily energy a lot. XO! Wizardry! What a handsome cake, and I loved reading about how you created it. And I’ve been curious about tigernut flour, I’ll have to try some out. Serious kudos my friend!! Oh my goodness, this sounds delicious. I am so intrigued about tigernut flour now, I have never used it. Great work. I can’t wait to try this! The tigernut itself is such an interesting little vegetable! They look kind of like brown shriveled peas, but a little bigger. The flour kind of reminds of the natural sweetness in oat flour. The horchata is soooo good too, and they even have strawberry, banana chai flavors. And they’re just sweetened with a little date puree. xo! I’m in awe of what you are discovering through this journey! You must feel like you are in a food chemistry class! It was so interesting to read how you are finding these different substitutions work together. So thankful you persevered to the end with this one – it looks delicious! I tried clicking on both the Organic Gemini entry by visiting their FB page as well as your and I “liked” both of them and yet it won’t count points toward it for my entries. Do you know why that is happening? Hi Nicky! Once you’ve done that you’ll need to come back to those line items in the raffle copter and hit the little button in the bottom right hand corner that says “I Visited”. It can be easy to miss. Thanks! Yes I did that and it still won’t apply the points. AMAZING! I love you for this because I am not a baker. I am so happy you are. I am going to see if I can whip these together for Sunday because CARROT CAKE IS MY FAVORITE DESSERT!!!!! This is the first I have heard of tigernut flour. The cake looks great, however, I am especially inclined to try your version of whipped Coconut frosting. Perfect combo with carrot cake and so many others. It looks delicious! I definitely have to try it. Are the carrots cooked before folding into the rest of the ingredients? Do you just grate the carrots or blend them? Hi Nadine! Sorry I didn’t clarify that, I’ve update the recipe, but yes – grated raw carrots. Hope you enjoy! This is gorgeous in every possible way. Would you believe I’ve never heard of tigernut until now? I learned something new today. I’m a big fan of carrot cake, but I’m steering clear of grains/sugars so this beautiful treat is right up my alley. And girl, all that recipe testing! I appreciate you getting it perfect. Genius use of gelatin here! 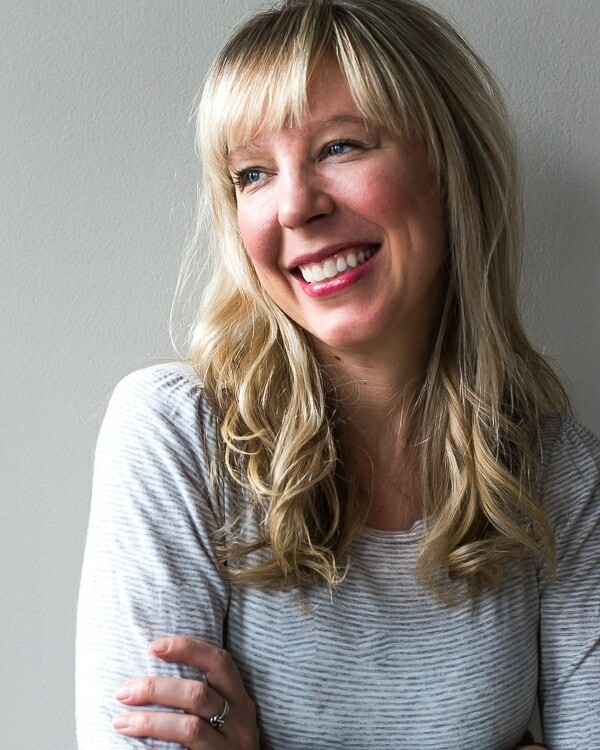 Pingback: 5 Minute Dessert For One (AIP/Paleo) | It's me, Charlotte! This looks delicious! Carrot cake is my favorite. I’m so excited to make this, it’s my birthday and was looking for a cake to be able to eat. My only question is I really can’t digest Tigetnuts and it’s so frustrating. Do you think I can use Cassava flour instead? You have amazing recipes and appreciate all your hard work. THANKS! Hi Sylvie! Sorry you have trouble with Tigernuts. It can be such a process to test what our bodies are okay with. This looks soooo tasty Amanda, perfect for Easter! Thanks for the great recipe! I made it this weekend. It actually has a moist crumb, although is maybe a little on the soft side (even after an extra 10 minutes or so). I would also add a bit of salt and I think you can also up the cinnamon if you like a really spicey cake. The tigernut flour has a crunchy/sandy feeling at times- I wonder if they make peeled tigernut flour? Anyway, this is one of the first AIP baked goods that I would actually make again. Nice treat. Hi Anna! I’m so glad you enjoyed. I was so happy when I finally figured out the recipe because I had been missing a treat too. I did have salt in the recipe, but it may have just gotten missed. As for the tigernut flour, I also wish I could find one that was peeled, like blanched almond flour is, but I think that would be really difficult as the skin on tigernuts is bumpy and irregular. That’s why I ended up going with a higher proportion of tapioca/arrowroot so it would blend in better, yet work with the chemistry of the cake. Thanks for stopping by! Thanks Amanda! It wouldn’t be the first time I’ve forgotten/missed the salt in the list of ingredients, oops! I also read that the peeled tigernuts you can find have been bathed in some chemical bath to remove the skin, so maybe the gritty feeling is all the better for us! Hi there! Your cake looks gorgeous! I just tried making cookies with tigernut flour today and thought that the texture was sort of gritty, but in a chewy sort of way. Is the texture of your cake also on the gritty/mealy side? Hi Tasha! I tested this recipe a lot because you’re right, tigernut does have a coarser texture than other flours. The blend I use in this recipe makes it soft and moist, and I’ve had other followers make it and have a great experience. Hope that helps! Thanks for doing all the work to make this recipe work. Our 4 yr. old daughter is on AIP and we’re always looking for ways to help her through her healing while letting her enjoy life’s simple eating pleasures. Her Daddy’s birthday is coming up and we wanted to share a cake together. This might be our winner! Hi! This recipe was a reader favorite and is featured at this week’s Paleo AIP Recipe Roundtable. Thanks for linking up! Oh great Eileen, that’s so fun to hear! I always enjoy all the inspiration that comes from your roundups and the wonderful community. Thank you! I’m so excited to have found this recipe! I’ve been on AIP for only a week and a half, but my birthday is in 2weeks and it will be nice to have an option to celebrate with. Thanks for sharing! Wonderful Emily! We loved it. And I hope you’re AIP transition is going well. It can be difficult, but know that the road to healing is a journey. This looks great and I have been wanting to try gelatin eggs. Being allergic to eggs and gluten I am always trying for the best baking results. I am interested in the tigernut flour, until we find some what is a good sub? We have almond flour, hazelnut, cassava, oat, millet, etc. thanks for this! Hi Jillian! The gelatin eggs are a really nice substitution. Just remember that you’ll have to work fast once you stir them in. Although I have not tested the recipe with the flours you have at home, if I were to guess which it would turn out best with I would say almond flour. You’ll need to measure it to the exact weight of what I used, not the cup measurement. I can’t guarantee that it will turn out since I’ve never made it that way, but let me know if you do try it! 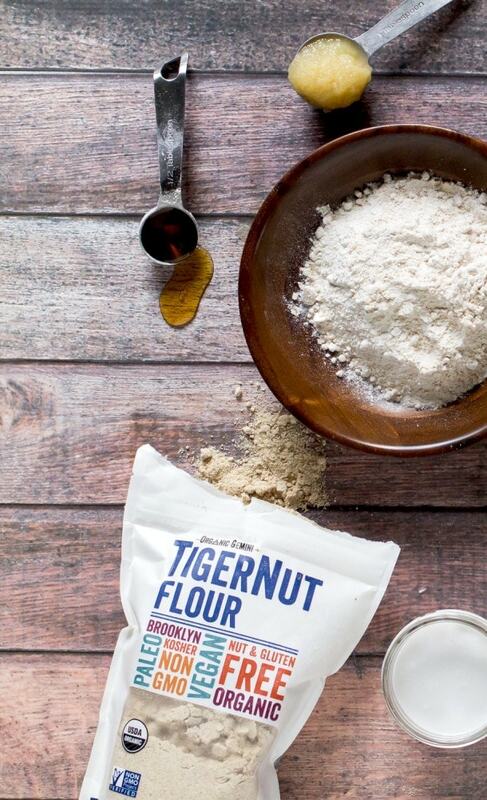 I’ve only RECENTLY heard of tigernut flour and have been dying to try it ever since! I’m so glad you shared a recipe using it – I’ve got to pick some up soon! This cake looks so delicious, Amanda! Can I have a slice? The recipe and resulting cake were perfect! Thank you so much for sharing. We did the calculations and a 1/16th piece is about 225 calories. It’s only my husband and me in the house now so I’m wondering how long you think the cake is “good” in the fridge and if you think leftovers could be frozen . Hi Diana! So fabulous that your family liked it. If you frosted the cake, I wouldn’t freeze it, but it should stay good in the refrigerator for up to 4 days. Thanks for sharing your joy! Could these be made into cupcakes? Hi Jessie! Yes, these could be made into cupcakes. Grease the inside of muffin tins with a good amount of coconut oil, then fill 2/3 way full. The baking time will be a little less, so I would maybe test bake one cupcake before doing them all to get a good idea of the time. Enjoy! Oh YUM! 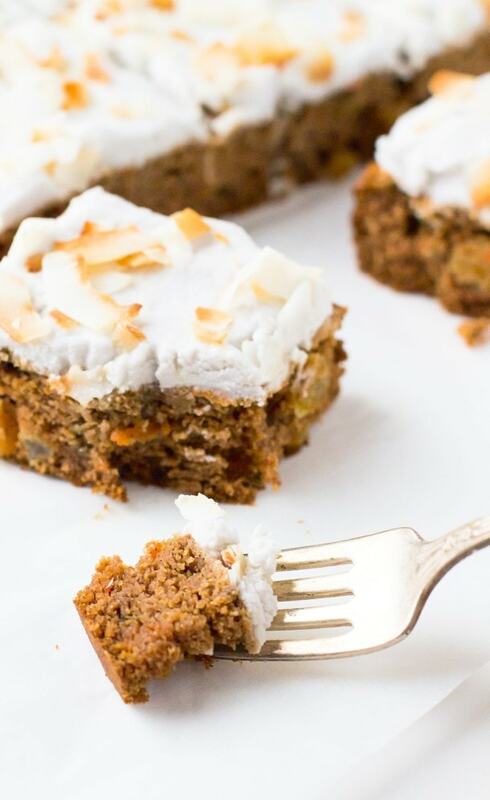 I love me a good carrot cake, and I love that you chose to make a coconut frosting! I can’t wait to give this a try! Pinned! yes, definitely a fan of the coconut milk frosting too! This looks AMAZING. I just got my hands on this flour last weekend and have all sorts of plans for it, I’m obsessed with the snacks and horchata they make. This will be on my list to try!! Isn’t the horchata delicious?! I loved the coffee flavor. So fun to have cool new products like tigernuts. Just made this and WOW. Perfect cake crumb and texture, great flavor. Just superb! The best gluten free cake I have ever had. Couldn’t get tigernut flower. Substituted with chestnut flour and it worked really well. Very moist and soft; taste great. Can’t wait to share it after dinner with my family. The best gluten free cake I have ever had. Couldn’t get tigernut flour. Substituted with chestnut flour and it worked really well. Very moist and soft; tastes great. Can’t wait to share it after dinner with my family. Menesia, I’m so glad that you enjoyed it! And wonderful to know that chestnut flour works as well. Sometimes we just need to use what’s in our pantry! Thanks for sharing your success. Hi Viviana! Another reader has used chestnut flour to replace the tigernut flour. Another option would be almond flour. Hope that helps! Oh, sounds devine! I’m so glad you don’t have to use dates! I don’t do well on dates. I am strict AIP and I really want to make this cake! Question.. Can I use the orange canister of great Lakes gelatin? That is porcine gelatin. But I think you said you had to use the red can? I am highly allergic to beef, so I have to use the pork kind! Oh please tell me I can still make this! Hi Jenny! Yes, the orange canister (porcine) will work. The reason why I don’t use that is because the pork is not grass-fed, but the beef is. I would not worry about that in your situation though, as you do the best with what you can. Enjoy! I made this tonight and it was amazing. So happy to have found your blog! I have tried several Tigernut recipes but this time I sifted all the dry ingredients and it made the cake WAY less grainy/crunchy!!! My husband and I both love it so much! Oh, YAY! So glad you and your husband enjoyed the recipe. And great idea to sift when using Tigernut flour. Is arrowroot starch different from arrowroot powder? No, they are the same thing. Happy baking! Not sure if this has been pointed out yet but the link for instructions on how to make the gelatin eggs isn’t working. I’m really excited to try this recipe but without the instructions I’m scared to try it. I tried making muffins from another site and I replaced the eggs with gelatin eggs and it didn’t turn out :( I didn’t use the Great Lakes brand, is it better than the stuff you get from the health food store? I’m going to order some today. Thank you so much and I can’t wait to try this carrot cake!!! This is my go to way to make gelatin eggs and works so well as a binder. Pingback: Quick Chocolate Dessert - It's me, Charlotte! This looks amazing Amanda! Can’t wait to try it. I’m intolerant to maple syrup though…would you be able to suggest a substitution for it here? Hi Cara! You could use honey (at the runny stage) in place of the maple syrup. Hello! I think another gluten-free flour of choice like millet or sorghum would work well in place of the tigernut, but I have not tested it this way. Anything that isn’t super starchy would be a good choice. This recipe sounds amazing. Unfortunately, I seem to be having a reaction to apples. I wonder if anything else could be substituted – pumpkin puree maybe? Hi Sheri! Pumpkin puree should also work. I would just add one more tablespoon lemon juice, as you’ll be missing some of the acid from the apples. I’m going to make this for my son’s first birthday! Is it best made the day of or could I make it the night before? Thanks! You could make it the night before, just store at room temperature, covered. Then frost when ready to serve. Enjoy! I just made this about 2 weeks into AIP. I know very well I should try to avoid the sweets and cakes but when you first eliminate, you search in vain for something that will satisfy the cravings. THIS was better than any cheat! Thank you so much for this recipe. I still consider myself fully complaint and very satisfied! My two boys also love it!! This cake si delicious, thank you! I have been on the AIP for a couple of weeks and this has come as a welcome treat! I haven’t done the frosting because I am not a frosting person, but the cake is indeed very good. 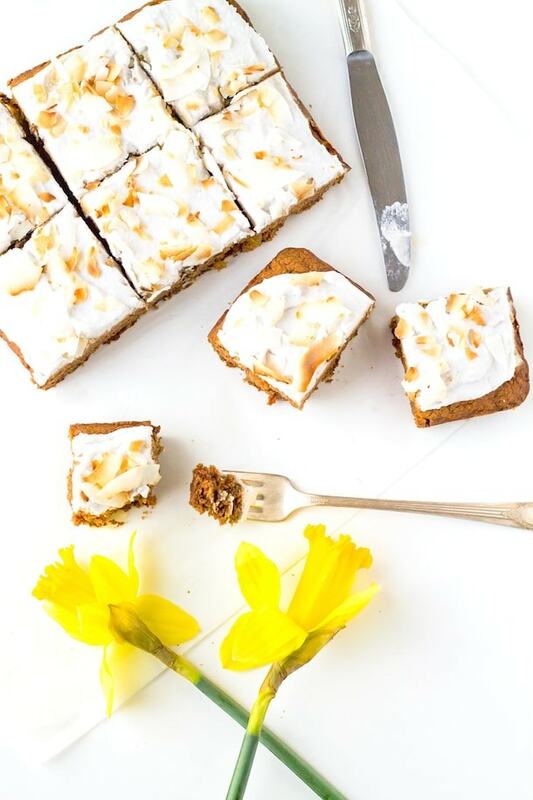 Going to try this with green banana flour in the place of tigernut which is just to expensive for me….but it looks great! Okay, I’ve never tested in that way Teri, but let me know if it works! Fantastic! I made this for easter and it was a real hit. I’m on the AIP, but now tolerate cashews so I made a cashew cream cheese frosting that made this seem like it was totally the real deal. The boyfriend loved it too. Will be making this one again! Gosh Kim, that cashew cream cheese frosting sounds amazing, I must try. So glad you liked the recipe. Thanks for letting me know your joy! How important is the apple sauce? I’m allergic to apples (and pears) and would like to make this for my husband’s birthday. Bananas would be an equal replacement! Hi can I substitute the maple syrup with more Apple sauce and add stevia for sweetener. I can’t do honey or maple syrup right now. not enough maple syrup – only used half the amount – not missing it. Still turned out great! This is a great basic cake recipe! LOVE this recipe – so amazing to have an option for my son who has multiple allergies and a healing gut, thank you!! Just have to share – don’t use Trader Joe’s canned coconut milk for the icing….Does not froth up like the Whole Foods brand I previously used. Have you tried the recipe as cupcakes/muffins? I can’t wait to try this! 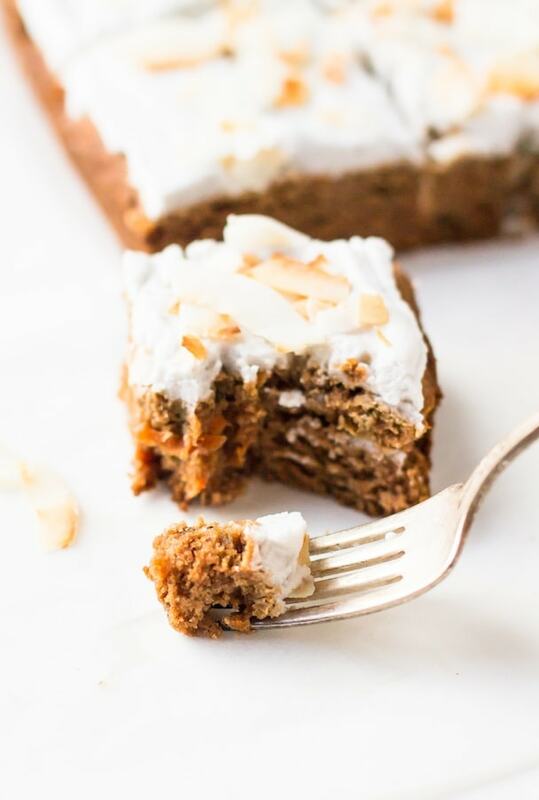 I also love carrot cake with cream cheese frosting, so I might try using some coconut yoghurt in the frosting recipe for a bit of that tangy flavor. It is a very good cake. The kids were amazed. I love carrot cake. I read through all the comments before I made it. I sifted through the tigernut flour. A lot of it does not go through the sift! It was a fine powder after that. It was such a good moisture and texture. It was just like any regular flour cake. It cooks so quickly too. I’ve never toasted coconut flakes so the first batch got burnt. I put them in the toaster oven on toast for 2:30 and that was enough to make them black. The second time I toasted them for 1 minute. They all wanted more! Thank you for taking the time to get this right. I appreciate it. Amanda, my mom always put drained crushed pineapple in her carrot cake. I was wondering what changes I would need to make to put in some crushed pineapple, 1/2 cup. Could I use it instead of applesauce? Hi Katherine! I’m not sure if pineapple would substitute equally because some of the reason I use applesauce for its acidic properties that react in a certain way to replace the egg. Loved this. Made the cake two days ahead of serving and stored it wrapped at room temperature Made the icing the morning of the party but kept it separate in the fridge for a few hours then served it on the side. It was really good and the texture was nice, like a spice cake. I did sift the tigernut flour through a fine mesh strainer. Thanks for a great recipe! So glad you enjoyed the recipe! And great make-ahead idea. THANK-YOU!!! So hard to find egg free thats also grain free DF n nut free. Have so many “allergies” I just eat mostly plain foods because I can’t have most spices. This cake was SO delicious! I finally used my tigernut flour n had to restrain myself from eating the whole thing in one night in case my reaction was delayed. I only had to make a couple minor changes which I can share for others out there who struggle. Did change the applesauce to pineapple which I just chopped n drained from can no sugar. Had to leave out cinnamon so heaping measures of ginger n cloves but it really had a bite which I loved but if my daughter had been home she would not have. Also used half honey n half malpe syrup. Did sift flour like others suggested. Took me so long bc I never bake that I didn’t toast my coconut for top but still loved it with or without any toppings. This recipe worked perfectly. I would add vanilla extract, but then I’m not worrying about AIP or paleo–just can’t handle wheat. Definitely making this again.